Why would you use integrated blinds double glazing? To start with they are maintenance-free and require no cleaning because they are dust-free. In addition to being dust free they are therefore allergy-free. They are already assembled and permanently sealed inside the cavity of the double glazing unit, so no need to have to fit them. We are one of the leading manufacturers of integrated blinds double glazing in the UK. Our extensive product range provides a cost-effective and innovative solution to window blinds that your customers will just love. Integrated blinds double glazing provide a superb solution, also known as the Integrated Venetian Blind, we produce it in our own factory in Corby. It is hermetically sealed within the airtight double glazed cavity. A great feature is that they make a positive contribution to improving the energy efficiency, light and acoustic performance of windows and doors. As well as providing comfort, they are the height of elegance and style. 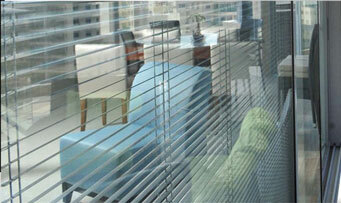 They have a very unobtrusive look and provide the perfect answer to blinds in windows and doors. including patio, sliding and bi-fold doors that are subject to direct sunlight or require privacy. they are manufactured ina wide range of colours, such that you will find the perfect colour to match and complement the decor of your room, office or hospital room. 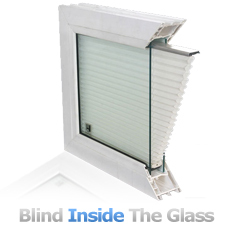 The use of a rotational magnet controller makes the blinds simple to operate. This mechanism allows them to be raised, lowered and tilted with ease. The mechanism consists of utilises two coupled rotational magnetic devices. One of the magnets is located in the blind head rail inside the cavity, whilst the other applied to the frame surface facing the inside of the room. The actual raising and lowering operation is managed with a continuous cord loop driven by the external magnet. The magnets have a lifespan of over 100 years, enough to ensure quality usage for a lifetime. Contact us to find out more about using Integrated Blinds Double Glazing.